This study was conduct to identify the effectiveness and heat recovery values of heat pipe heat exchangers (HPHEs) in heating ventilating air conditioning (HVAC) ducting systems. HPHEs are passive modules which provide the energy recovery function in HVAC systems. In this research the HPHE module consist of 42 heat pipe tubes equipped with 120 wavy fins on the evaporator and condenser sections. 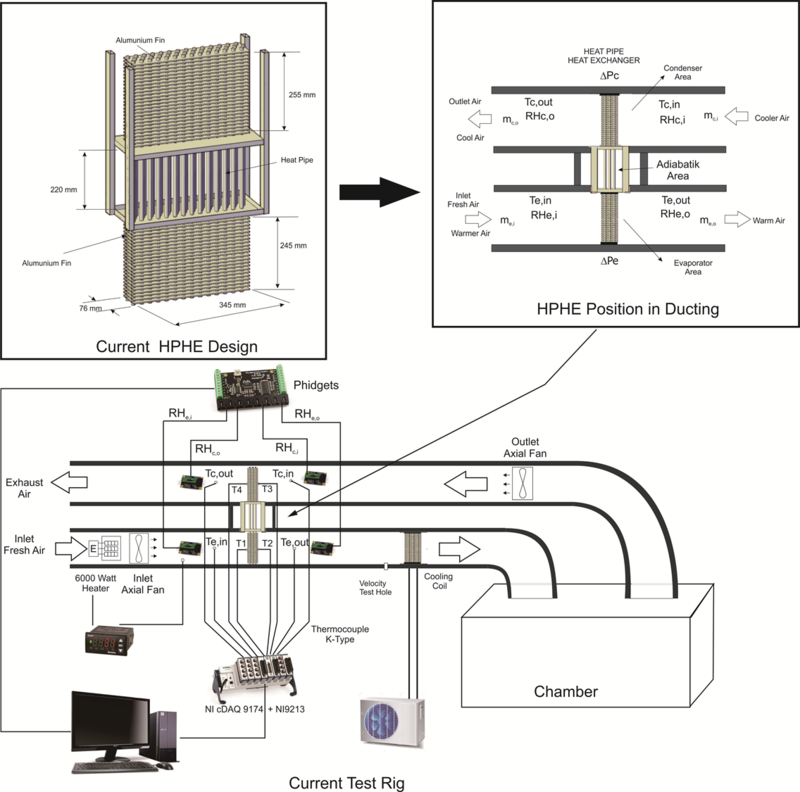 In this study the HPHE module was tested with a three-row configuration design, and at inlet airflow temperatures of 28, 30, 35, 40, and 45ºC. The velocity of inlet air also varied, at 1, 1.5, and 2 m/s. The results show that in the three-row configuration the inlet temperature decreased by a maximum of 10.3°C. This configuration also has an HPHE effectiveness value of between 47.9 and 54.4%. The highest effectiveness value (54.4%) was obtained at inlet air velocity and temperature of 1 m/s and 45ºC, respectively. The highest HPHE heat recovery value was 5,368 W at 2 m/s inlet air velocity, giving a 51.7% HPHE effectiveness rating. This HPHE system can be considered as saving energy for HVAC systems. A hospital is a public health facility that contains a wide range of room types. Among these are rooms with administrative, emergency, pharmacy, laboratory, isolation, intensive-care unit, and operating room functions. Some of these environments have specific requirements for electrical, air circulation, medical gas, and air conditioning systems. In particular, operating rooms have strict specifications often referring to existing standards. An operating room also has to operate with non-stop air conditioning systems. According to the standards of the American Society of Heating, Refrigerating and Air Conditioning Engineers (ASHRAE), operating rooms are required to have a specific type of HVAC system in terms of a number of indicators, such as temperature, relative humidity, cleanliness, and air changes per hour (Standard, 1999; Balaras et al., 2007). These indicators are an absolute requirement for maintaining the indoor air quality and thermal comfort of the operating room. The operating room temperature range is 20?24°C and the relative humidity range is 30?60%. The number of indoor air changes required is at least 20 per hour. HVAC operating?room systems are usually designed with non-stop operations and to strict air conditioning quality. This ensures the minimum cleanliness of the air, which is important for the health of patients. However, this type of arrangement consumes large amounts of energy and requires regular maintenance, thus increasing the production costs of the hospital. According to Vakiloroaya et al., 2014), HVAC systems are the highest consumers of energy in commercial buildings (Vakiloroaya et al., 2014). Coad et al. also state that annual energy consumption for health facilities is typically around 686 kWh/m2 (Coad et al., 2005). Thus, it is necessary to put effort into optimizing the energy consumption of HVAC systems without decreasing their quality. Conservation of energy, usually associated with security, reliability, and energy saving, has been investigated by many researchers globally. Some studies which relate closely to the scope of this present research have been carried out recently (Mahajan et al., 2015; Putra et al., 2016; Putra et al., 2017). Energy conservation is very important for improving the performance of energy systems, extending working hours, and optimizing energy use. Energy saving and indoor environmental quality are major points of concern for designers, owners, researchers, and governments (Rasouli et al., 2013). It is important for all parties to take part in finding solutions to these problems. Noie-Baghban and Majideian (2000) were the first researchers which investigate the use of HPHEs in the air system of a hospital surgery room. The HPHE effectiveness of 0.16 was achieved for their experiment result. It was relatively poor due to the high pitch-to-diameter ratio of the heat pipe tube and the shortcomings of fins. El-Baky and Mohamed (2007) applied HPHE to an air system by flowing fresh water at the inlet ducting (the evaporator section) and flowing the air return/exhaust water at the outlet ducting or condenser section. 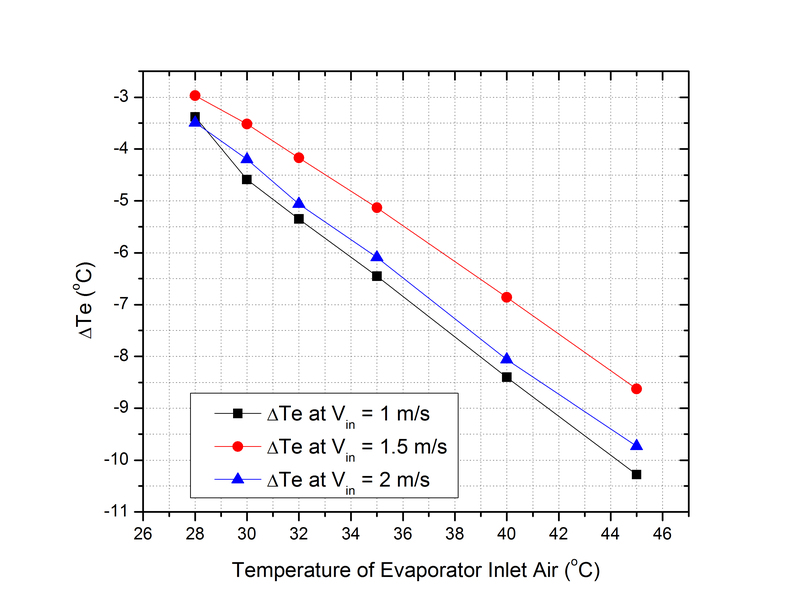 HPHE effectiveness value increases when the temperature of inlet water (evaporator section) is increased. Danielewicz et al. (2014) set the variables to include overall heat transfer, effectiveness, pressure drop, and heat exchanger duty based on flow characteristics and thermosiphon configurations in heat exchangers. The effectiveness increases with increasing numbers of rows, but the effectiveness value will decrease as air mass flow value is increased. Increasing the mass flow value causes insufficient exposure to cold flow pipes. The results showed that there was not enough time for the thermal energy released by the pipe to be absorbed. Putra et al. (2017) performed an investigation by testing an HPHE module within the air duct system. The heat pipe tubes were arranged in a staggered manner in several configuration variations. Their results showed that HPHEs can apparently reduce energy consumption in air conditioning systems. To continue the experimental work of Putra et al. (2017) this study uses an HPHE module which has been modified with multi-wavy fins. The heat pipes are also arranged in three rows and fitted into a galvanized iron frame. A total 120 multi-wavy fins were inserted in the evaporator and condenser sections. The main purpose of these fins is to maximize the heat recovery effect of HPHEs used in our previous work. The expected experimental results are improvements in both HPHE effectiveness and heat recovery values. In this study, HPHE was characterized by varying evaporator inlet air temperature and evaporator inlet air velocity. From the HPHE testing results it is concluded that the HPHE module was able to demonstrate its function as a heat recovery device. This can be seen in the precooling process of evaporator inlet air flow. HPHE shows significantly reduced energy use in HVAC systems and can be applied to such systems, especially in operating rooms. Changes in the effectiveness value of the HPHE module are seen by increasing the temperature and velocity of the HPHE evaporator inlet air. A slight decrease in the sensible effectiveness of the HPHE module occurs due to the increase of evaporator inlet air velocity. The highest heat recovery value is reached by providing maximum air mass flow rate and higher inlet air temperature. From the results, it can be stated that significant heat recovery effect was achieved from the HPHE module with wavy fins. At the lowest velocity inlet (1 m/s) and 35°C the multi-wavy fins increased the heat recovery by 211.8%, and an increase of 451% was achieved at the highest velocity input (2 m/s) and inlet temperature of 35°C. The author would like to thank the Ministry of Research, Technology and Higher Education for funding this research through the PUPT 2017 scheme with contract number 1167/UN2.R12/HKP.05.00/2016 and Mr. Iwan Chandra, CEO of PT. Aicool Indonesia for manufacturing the HPHE module.